Wilwood’s ProSpindle is specifically designed for use in fabricated A-arm suspensions on kit cars, street rods, drag cars and other custom or race applications configured around Pinto/Mustang ll suspension geometry. A redesigned one-piece forged steel body uses common Pinto and Mustang ll tie rod ends, ball joints, wheel bearings and seals. It is lightweight yet nearly three times stronger than OE or aftermarket two-piece cast iron and steel replacement spindles. The 2” dropped spindle pin provides the desired lowered ride height without disturbing the suspension geometry. Bolt-on steering arms are strong and can be reversed to accommodate rear steer configurations. They also allow the same spindle to be used on either side of a vehicle. 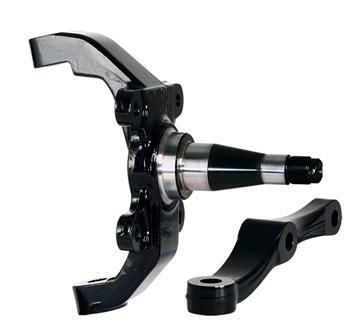 Bolt-on caliper brackets attach to substantially reinforced mounting bosses on the spindle body for secure, deflection-free mounting of four or six piston calipers.